We are delighted to pass on news that Daniela has been awarded a highly recommended status by the Wahanda web site. This rating is based on genuine customer reviews and only a select few achieve this award. If you’d like to see what all the fuss is about then please feel free to book in with Daniela for you beauty treatments here at Chelsea Natural Health. 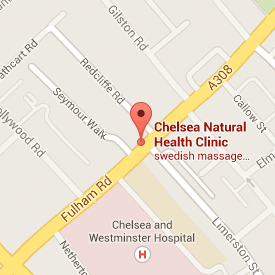 Daniela Karanesheva is at Chelsea Natural Health on Sundays and would be happy to discuss Manual Lymphatic Drainage Massage with you. Please feel free to contact her using the form and she will contact you to discuss your needs. Daniela Karanesheva is at Chelsea Natural Health on Sundays and would be happy to discuss Aromatherapy Massage with you. Please feel free to contact her using the form and she will contact you to discuss your needs. Chartered Physiotherapist, Massage Therapist and Beauty Expert, Fulham Road, SW10. Daniela is a member of the Chartered Society of Physiotherapy UK and is fully registered with the Health Professional Council as a physiotherapist as well as member of the British association of beauty therapy and cosmetology. She has worked as a physiotherapist over 10 years in various clinic departments including cardiology, neurology, Orthopaedy and Traumatology and 11 years in the private sector as a physiotherapist, spa therapist and beauty tutor. In 2010 she established the DANIELA HEALTH & BEAUTY STUDIO in Chelsea, offering first class physiotherapy, massages, facial and body treatments, building up a respectable client base both in private sector and show business. Available at the clinic on Sunday with home visit appointments available on any other day of the week. To contact Daniela please us the form provided.